Thanksgiving is nearly upon us and with all the hustle and bustle it's easy to get caught up the business of the holiday season. I find it's especially important to take time to slow down. In order to do that, my family will often listen to stories. Lately we've been listening to the all stories in the Thanksgiving category using the Sparkle Stories App. Our favorite happens to be the Martin & Sylvia's Giving Thanks Audio Collection. In this collection of stories, Martin & Sylvia's family is on the drive to Grandma's for their annual Thanksgiving Feast, and brother and sister learn about the magical power of two important words: thank you. They realize that feeling a "thank you" with their whole body can change how you feel – and change how other people feel, too! This lesson sets the whole family into a Thanksgiving holiday filled with appreciation, joy, and family adventure. In our family, it's important to say thank you, and even more important to feel gratitude every day. In general we try to say one thing we are grateful for every evening at dinner. For each day in November, we take the time to write those things down. The simple act of writing down on paper the things our whole family are grateful for, and being able to re-read them, gives us a greater sense of what is important to all of us. Finding gratitude every day also helps change a possible bad day into a good day. Whether it's a sunny day, a hug from a friend, narrowly missing a bonk on the head from an open cabinet door, or your favorite meal for dinner – there is always something to be grateful for. 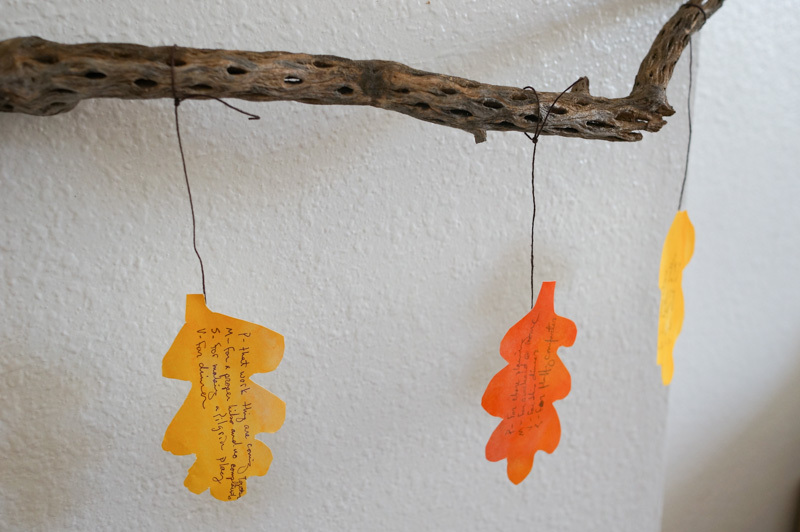 Gratitude Leaves are a fun and easy way to write down those things you are grateful for. Gratitude Leaves can also be a great activity for Thanksgiving. 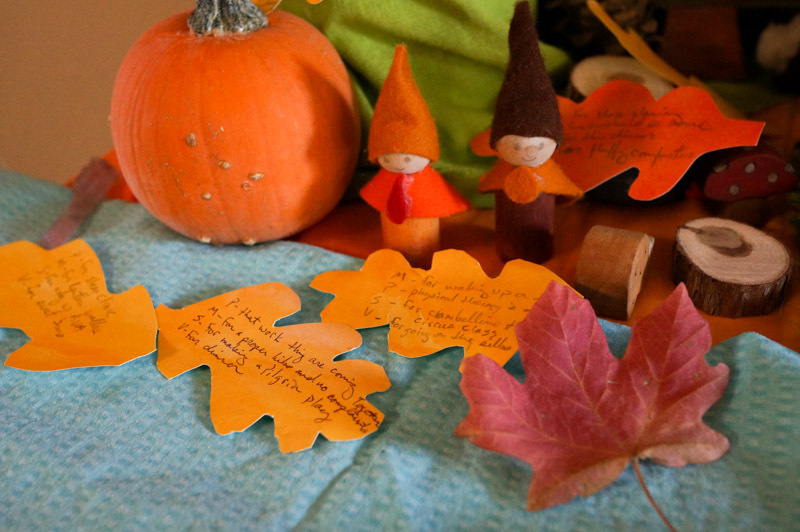 Have the leaves ready for everyone at your gathering so they can write down what they are grateful for. Begin by printing out the leaf pattern. (Or draw your own!) Cut out the leaves to use as a template. 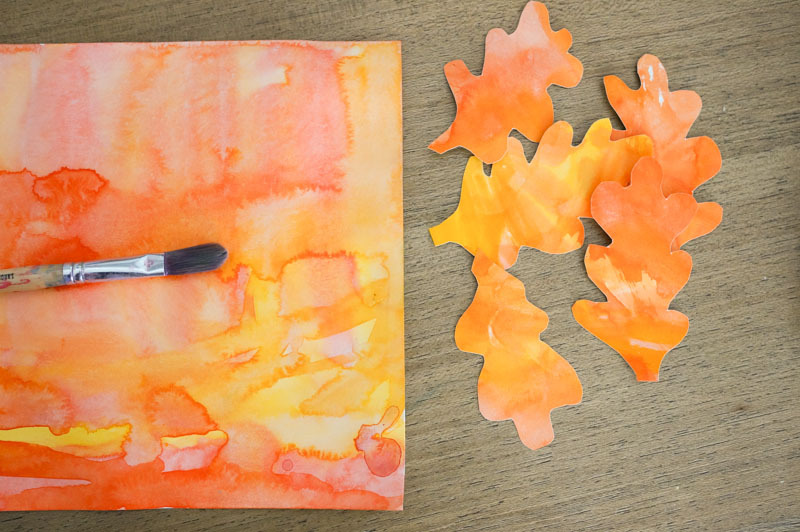 Using fall colors (or any colors that make you feel grateful) paint the watercolor paper. This is a great activity for kids. Make sure to paint enough paper so that you have enough leaves for everyone. 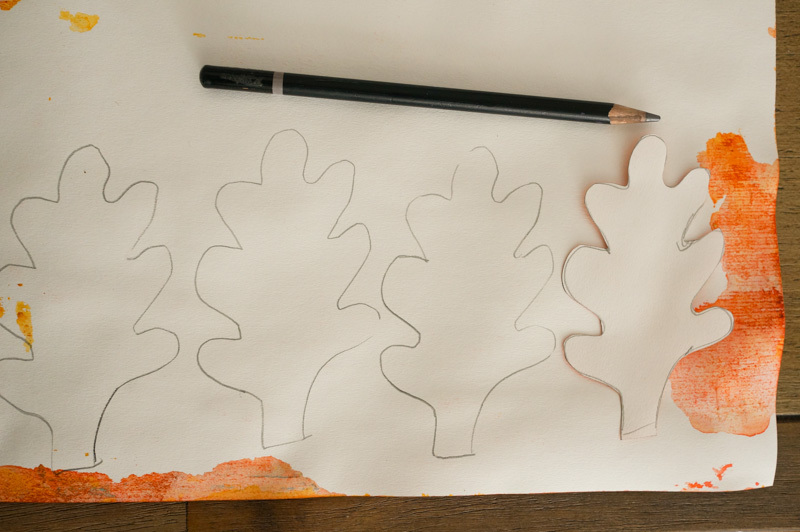 Once the paper is dry, turn it over and trace the leaves on the back of the paper. Then cut out the leaves and have them ready to go when you need them. You might be wondering, where to put the leaves after you have written on them? In our house, we do two things: we scatter them on our nature table, and we hang them with tape and string from a branch. On the drive to Grandma's for their annual Thanksgiving Feast, brother and sister learn about the magical power of two important words: thank you. They realize that feeling a 'thank you' with their whole body can change how you feel -- and change how other people feel! This lesson sets the whole family into a Thanksgiving holiday filled with appreciation, joy and family adventure.